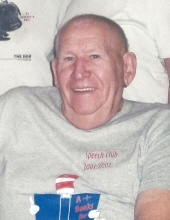 Steve Raymond Nolan, 87, of Seymour, Indiana passed away peacefully on Thursday, April 11, 2019. Born on December 30, 1931, Steve was a loving husband, son, brother, father, grandfather, great grandfather, and great-great grandfather, but to many who loved him he was just Papaw. He will be greatly missed by those who knew and loved him. He enjoyed woodworking, bluegrass music, working on vehicles, gardening, hunting, and watching the weather and news channels. He also loved to spend time with all of his "little possums" (grandchildren). Steve was self employed for the majority of his adult life, cleaning carpets, performing janitorial services for businesses in the Jackson County area, and operating a radiator repair shop. He served in the United States Army during his younger life, serving in Korea as an artillery loader. He loved to play his banjo and mandolin. Steve is preceded in death by his parents, Elvin and Alice (Gray) Nolan and his sisters, Nell Howard, Mildred Sowder and Roberta McKinney. He is survived by his wife of 35 years, Betty Ellen (Hamilton), his sister, Lena Minton and brothers Tony (Machusa), Troy (Sharon), and Delbert. He also loved his surviving children (Debbie Nolan (Steve), Barbara Toppe, Mary Fields, Glenda Teipen, Rea Webster (Robert), Bobby "Dinger" Harris (Debbie)), 9 grandchildren, 8 great grandchildren, and one great-great grandson. Donations in lieu of flowers can be made to the Alzheimer's Association. Brother Larry Dalton will conducts a funeral service at 1:00 PM Tuesday, April 16, 2019 at Woodlawn Life Celebration Centre. Visitation will be from 11:00 AM Tuesday until the time of service. Burial will follow at Butlerville Cemetery where Steve will be remembered with military honors. To send flowers or a remembrance gift to the family of Steve Raymond Nolan, please visit our Tribute Store. "Email Address" would like to share the life celebration of Steve Raymond Nolan. Click on the "link" to go to share a favorite memory or leave a condolence message for the family.